Will (Logan Marshall-Green) is invited with his new girlfriend to a dinner party with old friends, hosted by his ex-wife Eden (Tammy Blanchard) and her new partner, David (Michiel Huisman). The evening appears to be relaxed, but Will gets the creeping impression there's more to this evening. Is initially charming host David up to something? Or is it the result of being in a once familiar place, mixed with grief? A picture that's best ventured into knowing as little as possible, director Karyn Kusama crafts together a gripping view at the handling of grief. The directors deft handling delivers an ominous atmosphere, which is carried all throughout, as the picture proves tense to an unbearable degree. Helping things are the ensemble cast, who deliver fantastic performances. In particular, Logan Marshall-Green and Tammy Blanchard stand out, as both deal with grief in their own manner. While they both put on facades, it's clear this once loving couple are still hurting from something in their past. Special mention is deserved to John Carroll Lynch, who manages to command the screen through one monologue, delivered in a way assuring you won't forget it anytime soon. All of this leads to a third act, taking all that's come before and masterfully building off it all, resulting in something utterly stunning, while never letting up on the tension. You'll be hard pressed to find a more chilling final shot from any other 2016 picture. What Karyn Kusama has delivered is a stunning look at coping with grief, mixed in with unbearable tension. 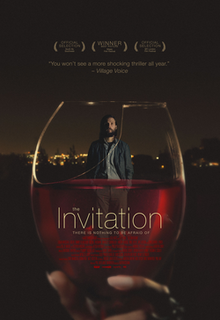 The Invitation is a masterful thriller which provides one of the years more tense experiences, to say the least.